Chrichton's World: Review Welcome to Collinwood (2002): Small but hilarious movie! 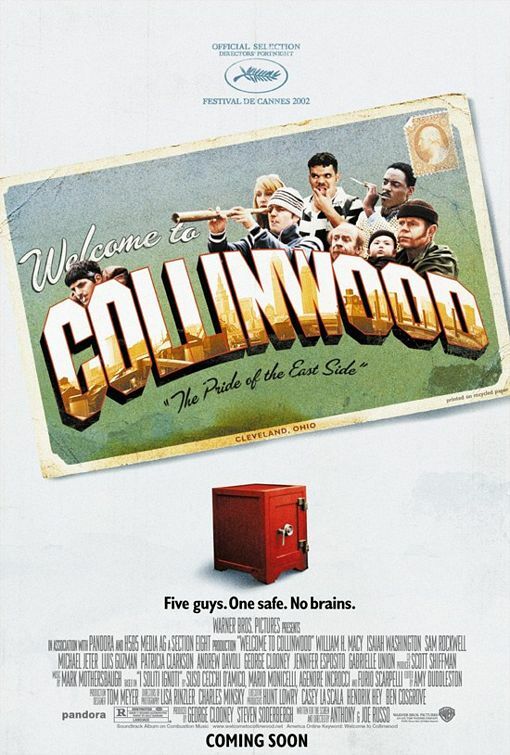 Review Welcome to Collinwood (2002): Small but hilarious movie! This movie completely took me by surprise. Did not expect it to be so much fun. For once criminals are shown as real people that can be human as they make mistakes but also very compassionate. They aren't perfect as depicted in most heist movies.It was so refreshing to see likable characters. Wait a minute, is this a heist movie? Yes,it is! But don't expect anything spectacular apart from the acting. It is the acting that gives Welcome to Collinwood it's edge. Had there been lesser actors this movie simply would not have worked.When this movie starts it doesn't have the appearance of a fully fledged comedy. But once you get to learn the characters better and get further in the plot it becomes funnier by the minute. Definitely a must watch!